The Autonomous Vehicle (AV) has been strongly heralded as the most exciting innovation in automobility for decades. Autonomous Vehicles are no longer an innovation of the future (seen only in science fiction), but are now being road-tested for use. And yet whilst the technical and economic success and possibilities of the AV have been widely debated, there has been a notable lack of discussion around the social, behavioural and environmental implications. This book is the first to address these issues and to deeply consider the environmental and social sustainability outlook for the AV and how it will impact on communities. Environmental and social sustainability are goals unlike those of technical development (a new tool) and economic development (a new investment). The goal of sustainability is development of societies that live well and equitably within their ecological limits. Is it reasonable and desirable that only technical and economic success comprise the swelling AV parade or should we be looking at the wider impacts on personal wellbeing, wider society and the environment? The uptake for AVs looks to be lengthy, disjointed and episodic, in large measure because it faces a range of known unknown risks. 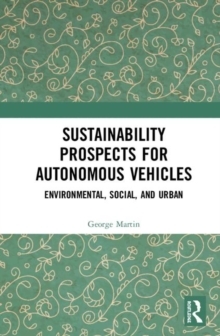 This book assesses the environmental and social sustainability potential for AVs based on their prospective energy use and their impacts on climate change, urban landscapes, public health, mobility inequalities, and individual and social well-being. It examines public attitudes about AV use and its risk of fostering a rebound effect that compromises potential sustainability gains. The book concludes with a discussion of critical issues involved in sustainable AV diffusion.